Are you looking for the best pool covers you can actually walk on? Owni?g a pool can be one of the best experiences in a person’s life. I mean, who doesn’t love the person who owns a pool. On hot summer days, you have your friends come over. On game day, you can have a cookout around the pool. Even after a stressful day at work, you can come home and relax in your pool. But what happens in the off-season? Or what happens when you have kids or pet running around that could easily fall into the pool? You definitely need a way to protect your pool not only from the elements but protect family and friend from your pool. That is why we think it is important to educate you on the kinds of pool covers that you can walk on, or at the very least, withstand the weight of an entire family. 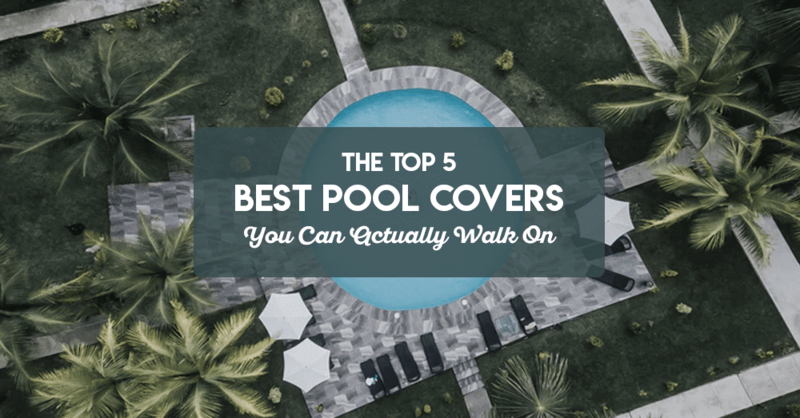 If you want to know more about the best pool covers you can actually walk on, please proceed reading. There are basically two schools of thought when it comes to pool covers that you can walk on; the first is a mesh type cover and the other is a hardcover. 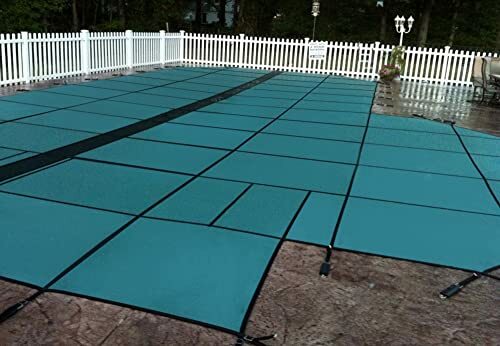 The Blue Wave, which is the first item in our “best pool covers you can actually walk on” list, an in-ground pool cover, is a mesh type material pool cover that can literally withstand the weight of your entire family. This pool cover is secured by attaching the support bands to concrete anchors that are installed all the way around the pool. The anchors are made of a durable stainless steel that guarantees that they won’t rust over time. This increases your investment and provides you with more peace of mind knowing that little ones will be safe. Blue Wave builds these anchors knowing what kind of weight they need to support, which is why they are installed in the cement. This allows the anchors to hold a significant amount of weight, without costing you a bucket of money on pool renovations. When you purchase the cover and anchors, Blue Wave sends you an instructional package that walks you through the step-by-step process of installing these anchors to ensure that it is done correctly. 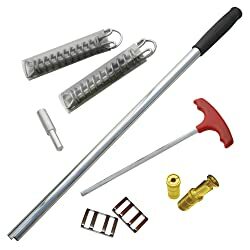 Of course, if you do not feel comfortable installing these yourselves, you can always ask a friend who knows how to install these or watch this tutorial video. This acts kind of like your typical trampoline. With multiple points of security, you get a tightly secured top that will withstand about 500kg of weight. This pool cover comes in two colors; blue or green. The benefit to this type of pool cover is that it can be secured and unsecured in a matter of minutes. Mesh covers are typically more lightweight but are still dependable as a safety precaution. And while you want to secure your pool from being a danger to anyone, these types of covers are not cheap. But the price here is definitely worth it since the point will be protecting everyone who is enjoying your pool. Of course, the price also depends on how big of a cover you get and the style of the cover. If you have a more standard pool, the cover will be more standard, and therefore the price will be regular. At any rate, it is a good idea to know exactly what dimensions you need before placing an order like this. You can check out on amazon.com a Blue Wave 20-ft x 40-ft or a Blue Wave Gold 25-ft x 45-ft depends on your pool size. Welcome to the heavyweight division of the mesh pool covers. Arctic Armor has engineered an incredibly strong two-ply polypropylene mesh cover that has a holding weight of over 3000kg. This cover comes with a 12-year warranty, which is an incredible deal for a mesh cover. 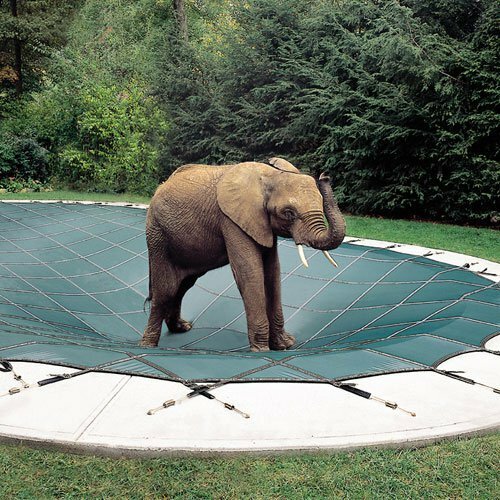 While incredibly strong, the Arctic Armor mesh safety pool cover is light enough to install with one person. This cover has a premium build, which translates into savings on a couple different levels. Not only will this cover protect your loved ones from falling in, but it will last you for at least 12 years. Also, the material is built to withstand UV rays so it won’t fade or breakdown due to Sun exposure. A major plus when looking at covers. The material has been engineered and manufactured in a way that weaves the material as tightly as possible, giving you the most security and longevity out of your cover. The type of material they used is a composite of raw and recycled material, so you know that you are making a difference for the environment and keeping your family safe. This cover comes in the standard green and blue, which seems to be the most popular. The cover comes with high-grade brass anchors that keep the cover in place without moving a centimeter. The best part is that this cover is 2 meters bigger than your pool, which offers even more protection against children or pets falling into the pool. Of course, by now you are asking, what is the price? And as you might suspect with this kind of a quality cover, with the warranty that it has, it must be on the higher end. You can check it on Amazon.com. But with the kind of cover that you are investing in here, there is no way you can go wrong. Overall, this is an incredible product that is back by a company with a long and successful history of building some of the best products and providing some of the best customer service in the market. You can check out on amazon.com a Arctic Armor Mesh Cover 16ft x 32ft. Remember when we said there are basically two kinds of pool covers; solid and mesh? Here is one solid pool cover that is probably one of the best on the market. 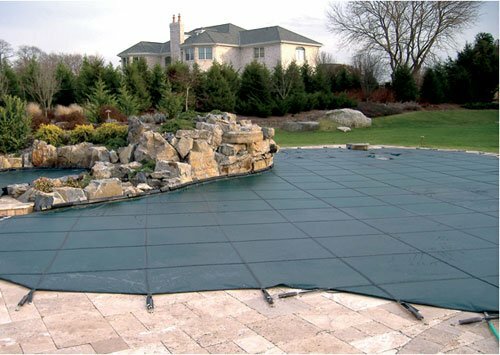 Loop Loc is the third item in our “best pool covers you can actually walk on” list. 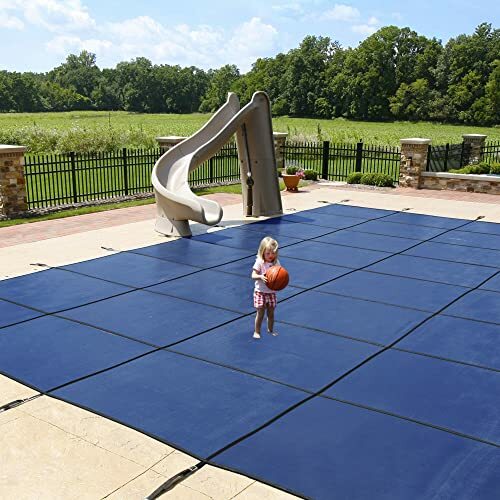 It is so confident in their solid safety pool covers that they advocate that your kids are safe to play on them. Each pool cover is made from 100% recycled material. Loop Loc is a big believer in bio-mimicry, which means that have fabricated these covers such that you do not need to clean them. They do not require maintenance. Unlike other pool cover manufacturers, Loop Loc is committed to fitting their cover to any pool or hot tub, period. No questions asked. Their pool covers come in three different kinds of colors; blue, green, or tan, and they back their product with a pro-rated warranty. Which is one of the best pool cover warranties on the market today? They have engineered a one of a kind material so that it is 33% percent lighter. Meaning that you can definitely install it by yourself, or ask someone to do it. Loop Loc covers exceed ASTM safety standards, which are important to note since not all covers are created equal. And Loop Loc has videos of elephants walking on their covers and the cover bouncing back to its original shape. You can be absolutely sure that you are getting the best deal here. Now, for a solid cover, it is assumed that you will pay more. However, for the warranty, premium build quality, durability, versatility, and all around fantastic product, you are going to spend more. They are still generally cheaper than your Loop Loc retailer. And if you are going to go this route, it may be worth it to invest in someone who is going to install it correctly. After all, it would be a shame to spend all that money on a cover and not have it installed correctly. The average cost to have someone come and install this kind of cover would be anywhere from £200.00 to £500.00. It would be done right and it would probably be done faster than you could do it on your own. But at any rate, this is definitely one of the best covers on the market that you will find, but you will have to get what you pay for. You can check out on amazon.com a 16 x 32 Rectangle or a 18 x 36 Rectangle depends on your pool size. They are an incredibly reputable and dependable company with a long history of providing phenomenal products. Which means that the GLI Solid Safety Cover is going to be on the highest end of the spectrum as far as cost and build quality. The GLI Supreme Solid Safety Cover is going to be another one of the best covers you will find. One of the reasons GLI’s is so highly recommended all of the time is because all of their products exceed ASTM standards. This is an internal policy of theirs to ensure that their products provide peace of mind and durability in the long run. This specific cover is built with a high-quality polymer that will withstand even the harshest weather conditions, and stand up over time. The solid construction eliminates any potential for accidental drowning, reduces algae build up, is UV resistant, and eliminates the need for spring cover pumping. Many solid safety pool covers require sump pumps or drainage flaps to be installed. With Leslie’s pool covers, there is no need for sump pumps or drainage flaps because of how well they are built. This cover protects from a wide range of elements. Leslie’s has tested their covers so that they are effective against falling branches, pets, heavy snow, heavy wind, and high amount of sunlight. In general, they are the ultimate protective layer for your pool during all kinds of harsh conditions. This cover will allow for your spring opening to be quick and easy with the minimal amount of cleaning needed. Because there are no UV rays that get through, there will be minimal if no algae build up. Meaning you don’t have to spend a fortune on chemical products or time scrubbing out the green sludge year after year. This cover is secured by in-ground brass anchors that hold up to 90kg each. Meaning that the accumulated total weight that this cover can hold equals about as much as your vehicle, but we don’t recommend testing that. You will have peace of mind knowing that your loved ones and pets will be secure year round with this easy to install, incredibly safe, solid safety cover. You can check out on amazon.com a HyPerLite 18ft x 36ft Rectangular or a HyPerLite 20ft x 40ft Rectangular one depends on your pool size. Of course, we have saved the best for last. All-Safe is a general provider of safety equipment, like fences and pool covers, which is the reason why it has earned a spot in our “best pool covers you can actually walk on” list. In this case, they have invented an automatic solid safety pool cover, which they advocate you can walk sit or play on. ​break and recover from that price we understand, but please keep reading. This cover is about to blow your mind. All-Safe builds an automatic installation infrastructure that completely takes the hassle out of installation. At the push of a button, you now have a solid pool cover that you can walk on, sit on, play on, and enjoy with complete peace of mind. Plus, the engine is hidden by a modern looking bench that you can sit on as well. This pool cover is ideal for you if you are remodeling or building a pool and are in need of a cover that will help save you more bucks on heating, chemicals, and preservation in the offseason. The reason why the company doesn’t recommend installing one on an already existing pool is that the return on your investment is not really in your favor. All-Star is one of the best in the business with a BBB rating of A+ and a 5-star review on Yelp. They are truly a name you can trust and as dependable as any. They build the installation motor with die cast components, which mean they won’t break down any time soon. The material that the cover is made out of is a molten vinyl that doesn’t fade, breakdown, requires maintenance, and is anodized with an architectural grade powder coating. Truly worth the investment if you have the resources. There is a lot of pool covers out there that you can choose from. We have listed several here for your choosing. A quick housekeeping note - before you place the pool covers be sure to pressure wash your concrete and blow out all debris within the area for a clean finish. If you liked our list, let us know in the comments section, or if we missed a cover that you were hoping to see. Give us a share if you have friends or family who would benefit. Thanks for reading this article about the best pool covers you can actually walk on and we hope to hear from you soon! 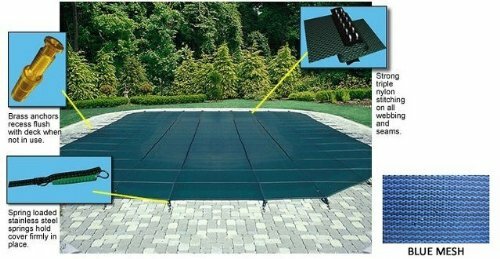 You could get more information about Best Solar Pool Cover taking a look at.